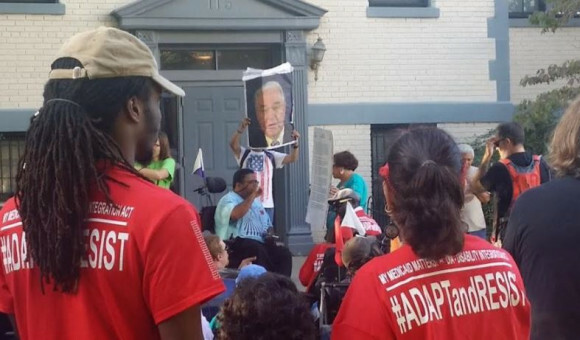 Above: ADAPT protest outside of Secretary Tom Price’s house on September 27, 1017. 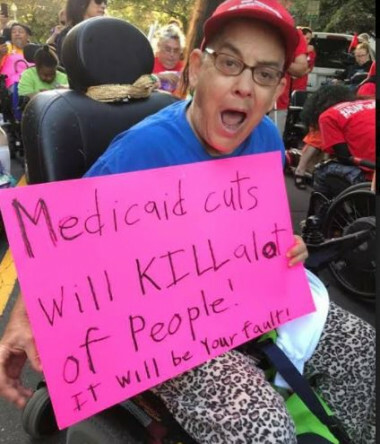 Over 200 activists from the disability rights group ADAPT are gathered at the Health and Human Services’ Secretary Tom Price’s Home. The activists are calling on Mr. Price to ensure the integration and equality of disabled Americans. We attempted to present our demands yesterday at the Health and Human Services headquarters, but were instead met with undersecretary John A. Bardis, who was less then helpful, given that he didn’t seem to fully understand the issues we are dealing with, including block granting Medicaid. “People with disabilities at the Judge Rottenberg Center are undergoing torture that we wouldn’t inflict on animals. People are being incarcerated in institutional settings with less due process than we provide people who are accused of crimes. When funding is available people may be forced into institutional settings by a lack of attendant care, caused in part by low wages. These are issues that I will care about until my dying breath, but which Health and Human Services officials don’t seem to even grasp” said Bruce Darling, ADAPT organizer. • Ensure that the Centers for Medicare and Medicaid Services use their authority to require states to implement managed care in a manner that affirmatively promotes community living. • Work with ADAPT and the National Council on Independent Living to reestablish the Money Follows the Person program as a funding stream for the provision of community transition services. • Stop the torture of Disabled Americans by instructing the FDA Administrator to finalize the FDA’s proposed rules banning the use of shocking devices. on Sept. 27, 1017. Source ADAPT. • Instruct the HHS Office for Civil Rights to take a stronger role in Olmstead enforcement by requiring states to develop and implement a plan to promote community living and comply with the Olmstead decision.